Joe and I are in KwaZulu Natal Province, in an area called the South Coast. We’re staying in a drafty cabin less than a mile from the Indian Ocean. The South Coast is known for sunshine and humid heat, but for the last few days it’s been rainy and downright cold. We’ve been busy the last few days, working and traveling and dealing with family issues. Today was particularly exhausting. Joe and I were so emotionally drained this evening that we could hardly speak during dinner. Then we walked outside and saw the moon. 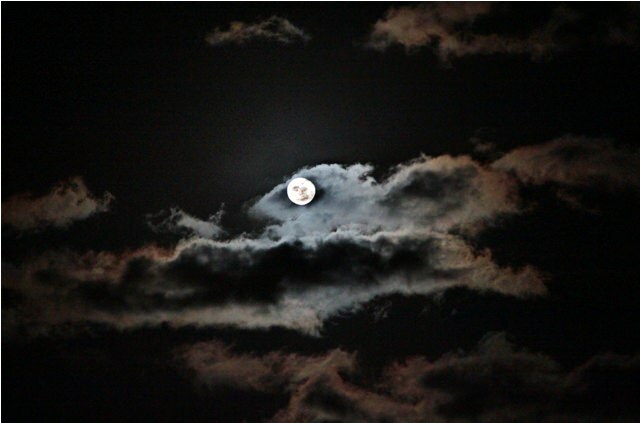 The moon was full two days ago, but it was hidden by clouds until tonight. We drove straight to the beach. The moonlight combined perfectly with light from the street lamp behind us. Then we took a short stroll on the sand. Special thanks to Joe for his invaluable photography advice and editing on this post. Sounds like a stressful time, Heather. Hang in there, both of you! I’ll be thinking about you! WOW! That last photo is unbelievable. I’ve never seen anything like it! Thanks Nicole, I got kinda lucky with that one. 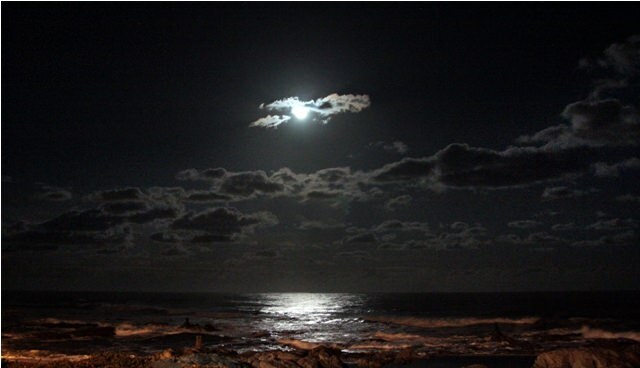 KZN South Coast is beautiful – hope you and Joe have some time to unwind and enjoy it and that you can get a breather from some of the stressful issues. 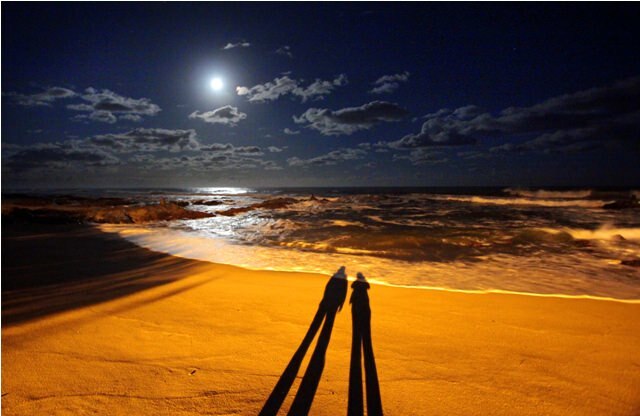 Your moonlight photos are incredible. I love this post. There is something about the ocean, that just makes you feel like you can breathe again, and forget about the stress, even for just a while. Good luck with your little dramas etc. The moon has been amazing, isnt it.. watching it almost always wipes out all my tiredness..
Moonrises, sunrises ans sunsets are just more beautiful here than in other places. Don’t know why. Beautiful photos Heather. Hope all is well. That final photo . . . wonderous! And just what’s needed after a hard day. Thanks Sophia. And the moon is beautiful again tonight! Wow! those photos are magical! Made me really miss the South Coast! quite some drive though… to PE… enjoy the stops! Hogback is a gem look up Starways Pottery, say howzit to Anton my mate! Remember, ” What is essential to the heart is invisible to the eye” The fox said that to the Little Prince! Fab drive through there, breathe the space and air. Awesome photos! The first one looks more like a painting than a photo.